Caroline Rose Hunt needs no honorific before her name: Her accomplishments precede her. Scion of a legendary Texas family, she was born into a position of influence in Dallas but she has not rested on inherited laurels. To begin: she is the mother of five children, grandmother to nineteen, and great-grandmother to 22. Her family is her greatest wellspring of pride. 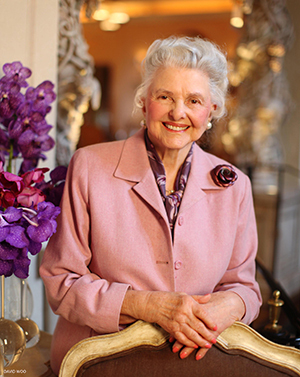 She has been an hôtelière extraordinaire, opening the Rosewood Mansion on Turtle Creek and founding Rosewood Hotels and Resorts in 1979; a novelist and, as an accomplished gourmet culinarian, a writer of cook books. In 1990 she developed a line of bath and skin products with a signature scent, Tryst. Her entrepreneurship has set a tone of elegance in all of her endeavors. Caroline Rose Hunt holds honorary doctorates from Mary Baldwin College, Staunton, Virginia and the University of Texas, Austin and a notable list of honors that span decades from the 1980’s to the present. She remains active—in fact, indefatigable—serving, chairing, organizing, and contributing to philanthropic efforts, within and beyond her beloved Dallas. She has led a legion of charitable institutions and worthy civic efforts—always generous with her time, treasure, expertise, and guidance. Caroline Rose Hunt has been a lifelong supporter and contributor to the arts. She first met Billie Holladay, with her husband, Wallace Holladay, founders of The National Museum of Women in the Arts, in the early 1980’s in Texas while serving as a Presidential appointee to the Board of Trustees, Executive Committee of the John F. Kennedy Center for Performing Arts. She was immediately impressed with the proposed Washington museum and became one of the original members of the newly created Texas Committee. She served on the first Board of Directors when NMWA opened its doors in 1987 and has continued as a member of the NMWA Advisory Board. She has contributed significant works of art and has enriched the museum’s library with the donation of books. She has been a lasting friend and a source of inspiration to the Texas Committee. Caroline Rose Hunt is lady of grace who has embraced the common good and left all she has touched the better for her presence. And she still is in her office every morning. 1 Holladay, Wilhelmina Cole A Museum of Their Own National Museum of Women in the Arts, 80. Abbeville Press.